Have you heard the poem, “April showers bring May flowers…” It is raining here, so we better get a start on our garden of flowers! This flower is larger in scale than most of the tutorials we have worked on to date. It is stitched in 5 simple passes. That sounds complicated, but it is not! The “rails”-(our drawn guidelines)- are 1-1/4 inch apart. 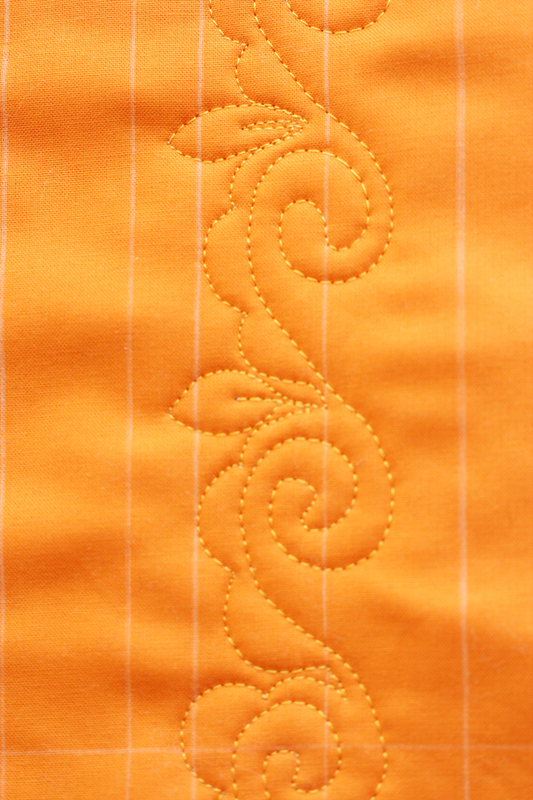 The entire motif is 2-1/2 inches wide. 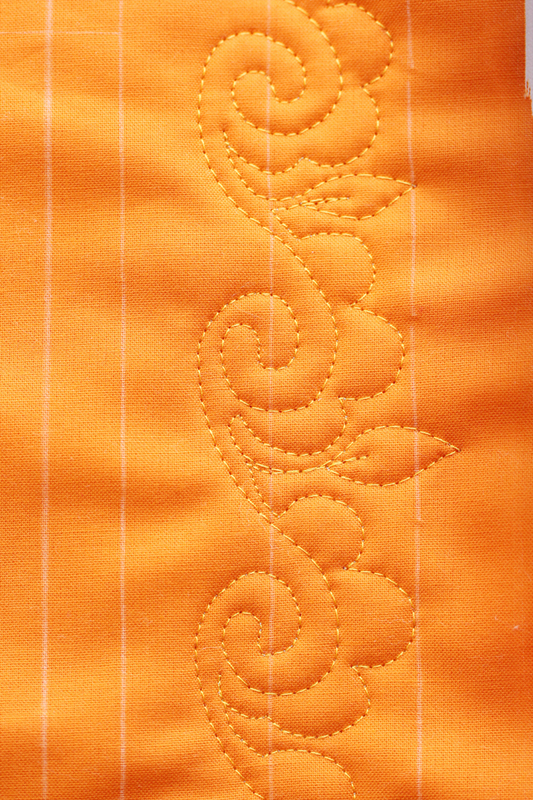 The second “pass” stitching forms the petals on the right side of the motif. –Stitch scallops around the circle of the spiral. 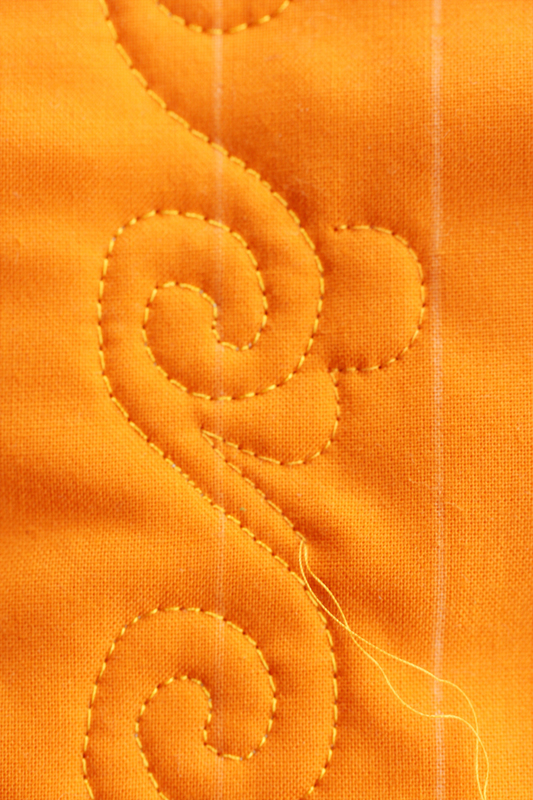 If the spiral “tail” is long, stitch next to it to form a stem. Add a leaf if there is extra room. It is not necessary to add a leaf for every flower–in fact, I find it more interesting if the leaves are different and added in an irregular pattern. 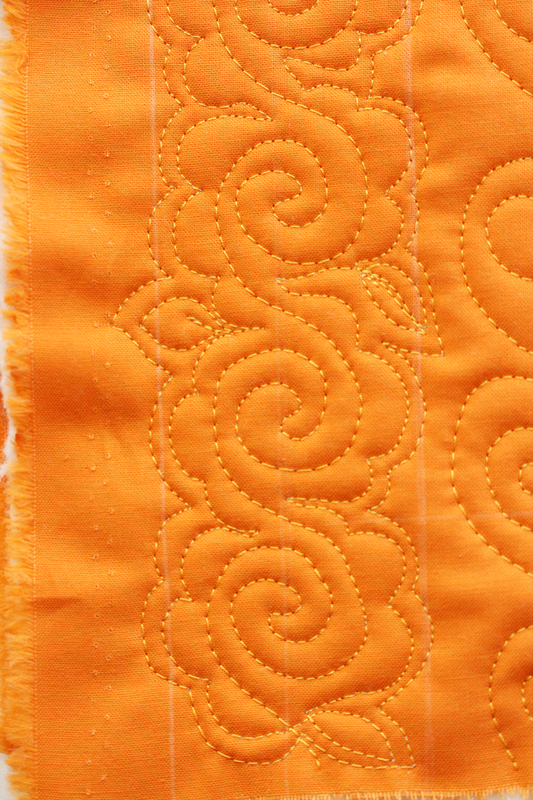 The final two “passes” give the motif a very polished, finished look–and they are the easiest…Simply echo quilt along each side of the flower! Next week: We will begin working with circles! And as always, thanks for pinning on Pinterest! this design is absolutely beautiful & so clearly written….thank you!! I love this design and can’t wait to try it! It is a lot of fun to stitch–and so many ways to use! Thanks for stopping by! Really, really beautiful design. I can’t wait to try it! Thanks. I can’t wait to see your version! I always look forward to your new tutorials. This one is really great, I love the flowers. Thanks so much for sharing with us each week. I am thrilled to hear you like the tutorials. Please send photos of your flowers! Not a chance! Just look outside! Wow!! This one’s gorgeous. 😀 Man, I have to think of a project that can incorporate this one FOR SURE! I would love it if you would forward a photo! I’d love to see all the flowers! I love this! Very well done and you make it look so easy! I’ll be giving it a try. Can’t wait to see your fabulous flowers! And thank you for re-blogging my Easter Eggs! Thank you for sharing. I love your flower design. Thank you for sharing, I have to try this lovely design! I think the landscape could use a few more flowers right now! I truly, TRULY appreciate the time you take to break down these free motion techniques. You make them *doable* for those of us who struggle to learn & master this art. I’ve filled several quilt “sandwiches” since discovering your wonderful blog. Thank you & please continue to share your talents? ooops…forgot to ask…would you mind showing how you did the REST of this tablerunner, too? Did you pre-mark the straight lines to get them so evenly spaced? Did you track along the final outline scallops to move from one to the other? How do you get your little circles so perfect in size & shape? Sorry for all the questions!! Dear Rett, I am delighted to receive your questions…it really helps me understand what readers are looking for. 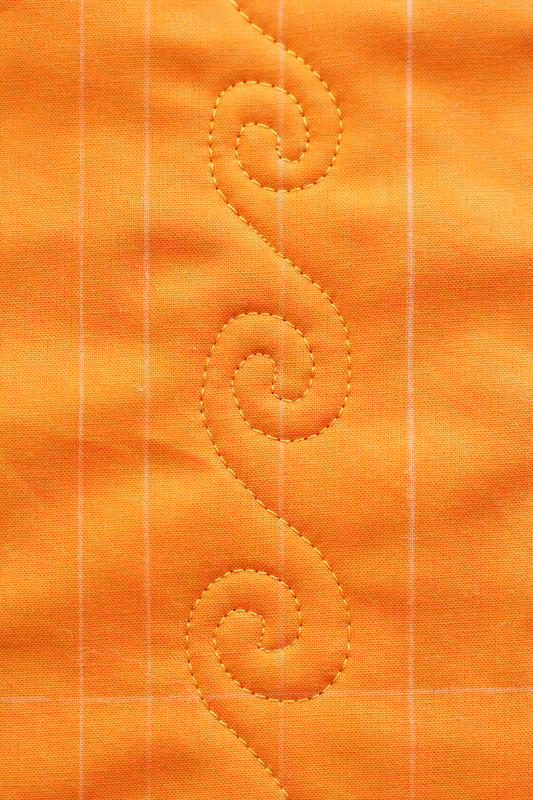 I will do a post on making the tablerunner, and next Tuesday the tutorial is on how to make circles. In the mean time, I do pre-mark the lines for the circles. I did track along (or echo-quilt) the scallops, and circles take practice–but mine are NOT perfect. I never see perfection as the goal–they repetition of the pattern often gives the impression of perfection, but if you look at each circle–most are not perfect. Thank you so much, Lori, for explaining & doing the demos. You have helped me get over my fear of free motion more than any other quilter…honest! I had just about given up on being able to do anything other than a stiple & a meander. Got those down pretty well but anything more intricate, I struggle. I love how you have simplified this motif. The result is beautiful. I’m so glad you like it! With Minnesota expecting 5 more inches of snow this weekend–it may be the only flowers I see for some time! This is so gorgeous – I am in awe …. 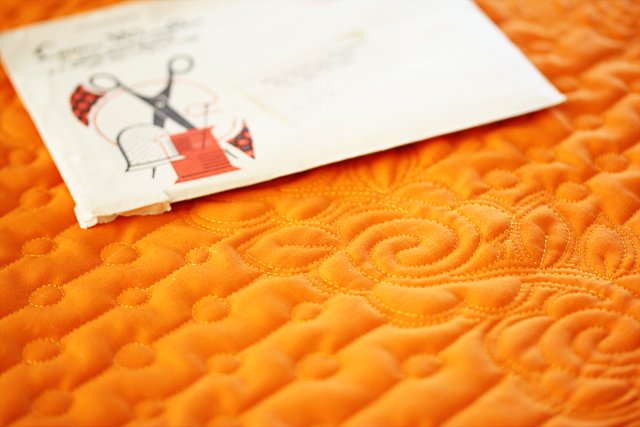 I used this tutorial to quilt one of my quilts. Can I link this post to my blog when I blog about the quilt? Please do! Can’t wait to see it! Oh, thank you Your tutorial was so easy to follow. I’m so grateful. It helped me out a lot I am incorporating it into a quilt for my sister. She means so much to me and she is just like your flower — beautiful!.